Gotta make a move to a room that’s right for me. Room to keep me movin; keep me groovin’ with some energy. Well I’m not just talking about it anymore. 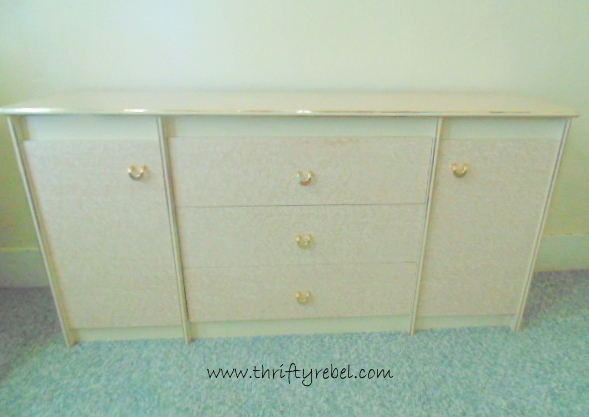 I’m really movin’ along with my master bedroom makeover, and I’m super excited that my dresser is finally finished. Yay! She’s a little french country, and a whole lotta funky. I call this style French Funky. Hey… I think I might have just created a whole new decor genre. French Funky… I like the sound of that… but that’s probably just me. lol. My totally lost in the 70s dresser was singing to me from the get go. “Won’t you take me to funky town? Now who could turn down a challenge like that? Not me. 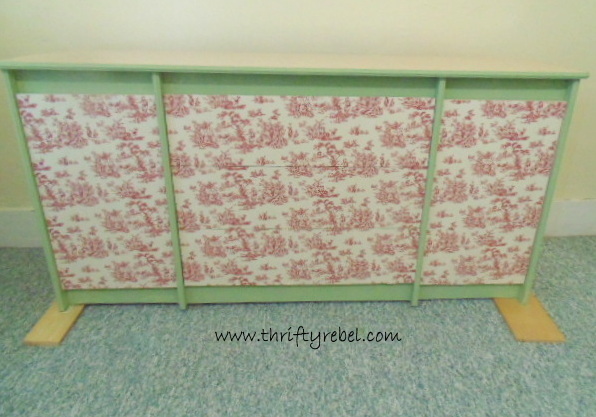 I was totally going to take this dresser to funky toile town. I’ve been singing, humming, and dancing that song for days now. I can’t get it out of my head. It’s so fun!!! 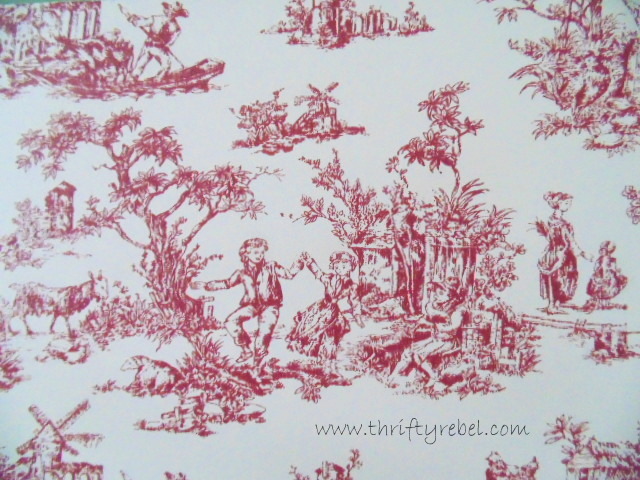 “Won’t you take me to funky toile? Now… I ask you… how often have you heard the words funky and toile in the same sentence? I’m guessing probably never… and you’ll probably never hear it again. lol. But in my little whimsical corner of the world they live together quite happily… and why shouldn’t they? 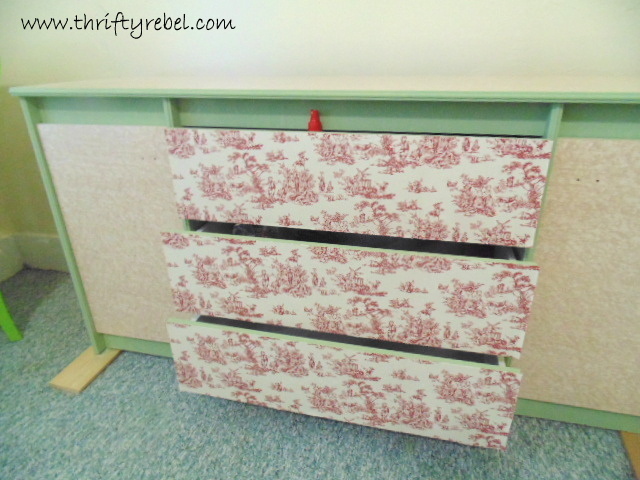 This dresser was just screaming funky toile. Now… should you for some unfathomable reason want to try your hand at some toile funkifying yourself here are a few easy steps. Find the loveliest 1970s plastic laminate fake marble dresser that you can find… with some much coveted gold plastic handles. Scour the land if you have to… every flea market… every garage sale…every estate sale… until you find it. For some unexplainable reason it’s out there… I promise. 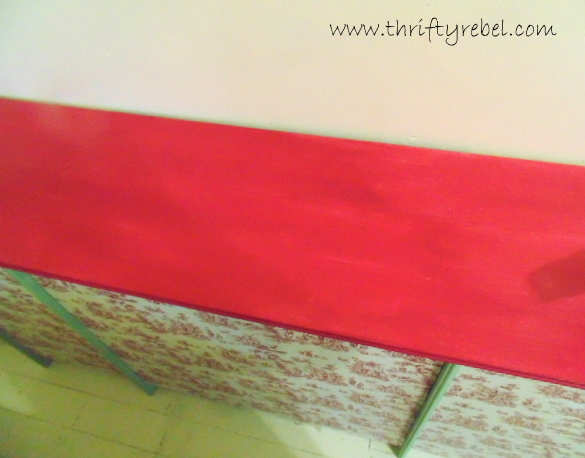 Spread some homemade chalk paint in a contrasting colour on the dresser wherever your funky self thinks it looks good. Now be very careful here…. because you’re about to venture precariously close to the slippery sloped edge of tacky town. And once you start sliding there’s nowhere else to go. Believe me… I know. I’m a rebel who practically lives on the edge of that edge. But, “Won’t you take me to tacky town?” is not the song we want to be singing. 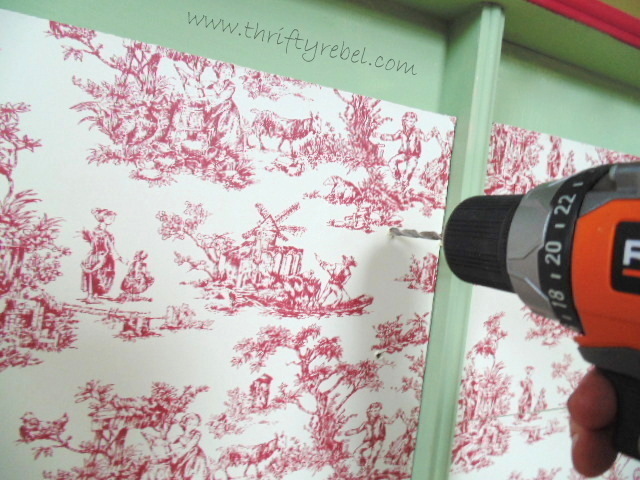 Next… grab some very respectable thrifted french toile wallpaper from your stash. If you don’t have a stash you might have to raid someone else’s. Or heaven forbid… do something that I would never do… buy new. Gasp!! Now gently slap the toile wallpaper on to the drawers, and just watch as your dresser starts to miraculously funkify itself right before your very eyes. Slice the wallpaper between the drawers with a very sharp exacto knife to separate them and let them dry. Then trim up any edges, again with a very sharp blade. A little more gentle slapping… on the doors this time. Now take a colour that you’re absolutely crazy about and after priming the top, spend hours applying coat after coat after coat after coat. And don’t forget a couple of coats of a protective verathane on top of that. Make sure the colour is worth the workout before you start. For me… this Behr French Rose Red definitely is. This pic is after one coat. Find some thrifted handles in your stash and paint them in layers so if they ever chip you don’t have to worry about it. Chippiness is good… right? Then measure, mark, and drill the holes for the hardware. Measure twice or three times or even four times if you have to… before drilling. Don’t ask me how I know this, but if you take nothing else away from this post remember this tip. And here she is… in funky town… groovin’ to some funky music… in all her French funkiness. She’s so fun… and I adore her. to funky French party girl. 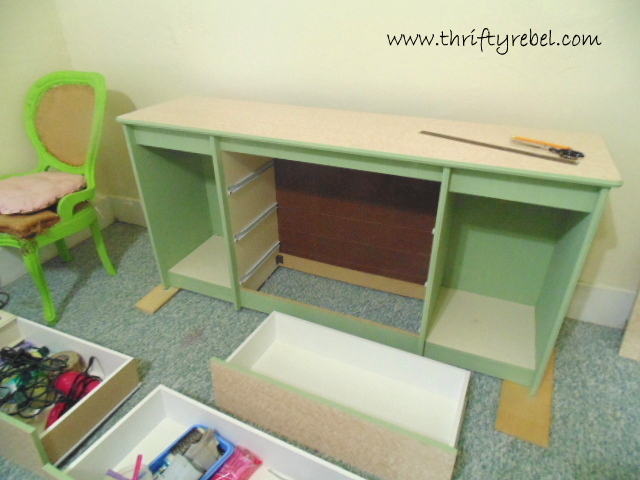 She was such a fun dresser makeover. Here she is with her escorts. There’s still so much to do in this room. Like the whole other end of it. Not to mention a few more projects on this end… and the floor too, but I’m getting there. I’m living on the edge friends… living on the edge, lol, and there’s no place else I’d rather be. Have a fun and funky day. Oh oh… I can’t stop! Please… somebody slap stop me!!! Tuula, you must have been one of the "cool girls" back in the day! And you still have your coolness with all of this! Love your new "funkified" master bedroom! This is so awesome! The picture over your bed takes on a whole new aura and I'm liking the total look! You can take us down to funky town anytime! Wow! What a transformation! It is so fun and funky…I love it. The colors you used are awesome. Your room is looking great and I can't wait to see what you do next. Have a wonderful day. Rock on girl…or I guess I mean Pop on! What a 360 degree makeover. The red was the perfect icing on the top too! I wouldn't have known it was the same dresser. Wow! I didn't see that coming. That is a super transformation. 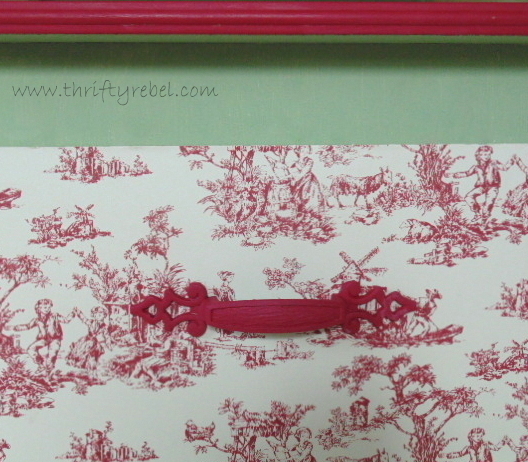 I love the colors sagey green with red toile. Great job! Found you on Charm of Home. You've created a one-of-a-kind piece and it really works with the mirror. Looks super cute in that bedroom. Congratulations! 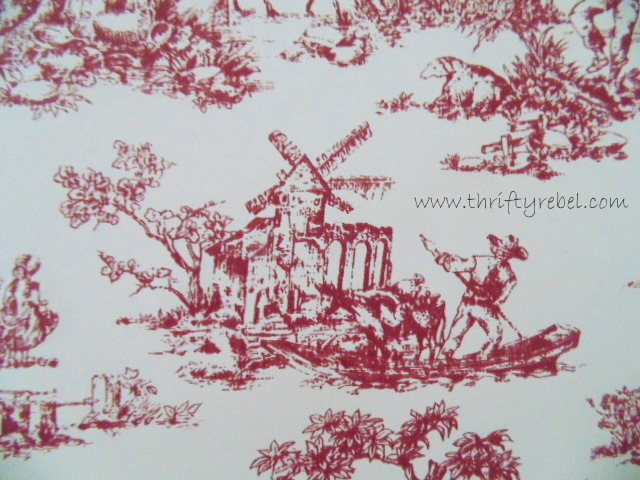 Funky French Toile!!! Love it – and you were right my funky toile rooster would have been right at home here. Love the whole end of that room. the frame saved from the bonfire is great paired with the mirror over the dresser. Sharing and pinning! 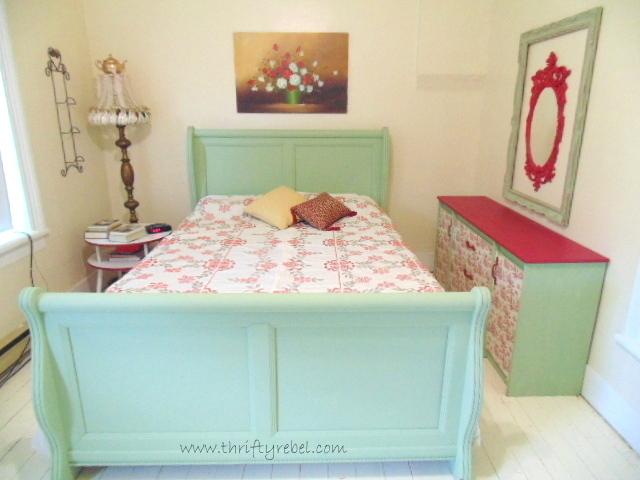 Wow Tuula the furniture and everything you transformed looks so beautiful and bright cheery colors. Hope all is well with you. Enjoy the weekend. I sure hope you have stopped singing that song! I do love the funky dresser, though. 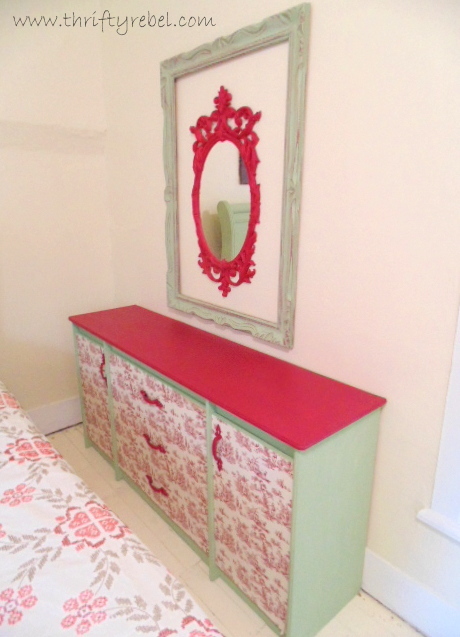 Red, green and toile are all up there in my favourite things list so this makeover is a winner. You are hilarious! Thanks for making me laugh while I catch upon blogs on this exciting Friday night! I love your funkified dresser! Only you could pull it off Tuula! Nice one! This is SO much fun! I have been to tacky town a few times. I love your French Funky or Funky French decor. Funky, it would be a great teen room too! That looks like a very happy room … great job. I have used fabric on furniture before and it turned out great. Oh my gosh, I love that French Funky Party girl! I am a toile lover and she is so darn cute! Thanks for sharing her with SYC. You already know how much I love this dresser, but had to come say thank you for linking up to Make It Monday! 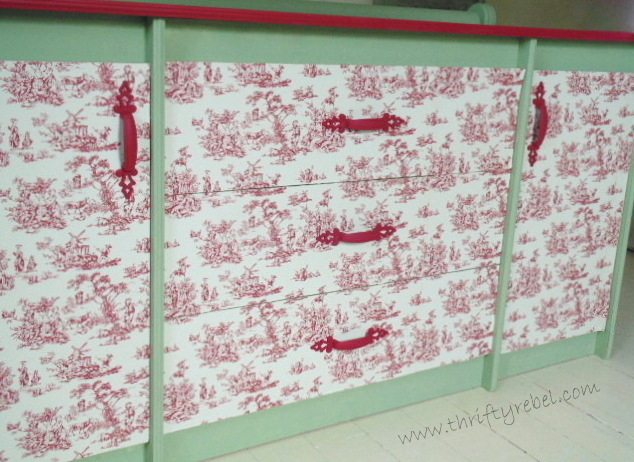 I love the toile print you used, as well as the colors. 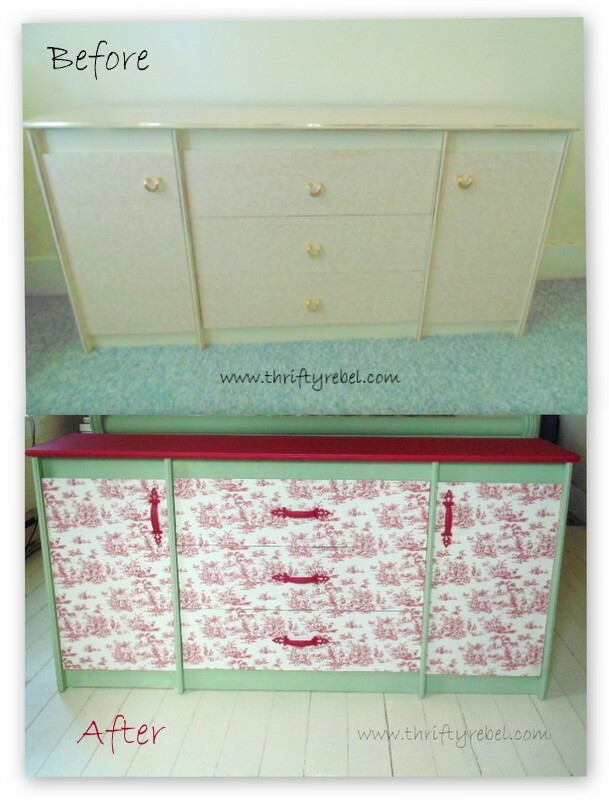 It really transformed that dresser! Thanks for linking up to Make It Monday, our new link party! Lol, great directions. Your set is really coming along. Can't wait to see the whole room when it's done. Thanks so much for sharing at the Make it Monday Party!